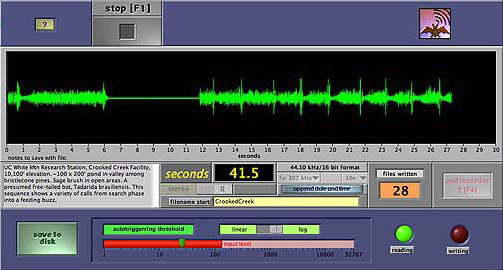 Screenshot of AutoRecorder panel. The AutoRecorder will continuously recognize and record call sequences to your computer and save them with a filename header and date and time stamp. The AutoRecorder lets you automatically record files and have them saved as SonoBat wav files possessing SonoBat file attributes. You can then analyze them using SonoBat or other signal processing software. This greatly facilitates monitoring efforts, particularly when you would like to simultaneously monitor multiple sites, or carry on the monitoring while you tend to other tasks. With a direct connection from your computer to an autotriggering detector (e.g. Pettersson D240x) to automatically collect call sequences. When used in this way, you can set the AutoRecorder to append a date and time stamp to a filename that you specify. To automatically download a tape of auto-recorded call sequences and parse them into SonoBat wav files. This eliminates the onerous task of performing this manually. To easily record call sequences to the computer with a manual triggering detector (e.g. Pettersson D240). Each time you trigger a call, it will be named and recorded. and so on. The time format is HHMM,SS.